Take a trip to a magical candy land with Candy Spins. 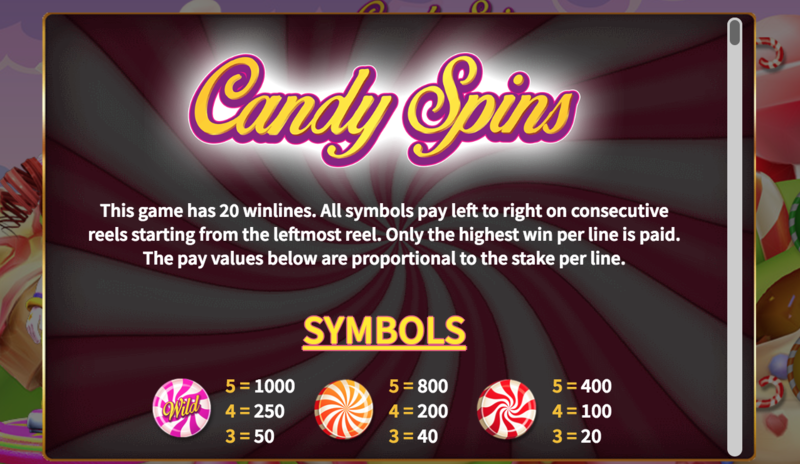 Candy Spins is a 5 reel, 20 payline slot by Leander Games with a deliciously sweet candy theme. You'll team up with Candy in search of the tastiest treats in town. If you're lucky, you may discover that these tasty treats are worth a hefty fortune. The design will make your mouth water with all of the candy canes, caramel hearts, and lollipops. The colours are fun and girly with a lot of pink and pastel colours. 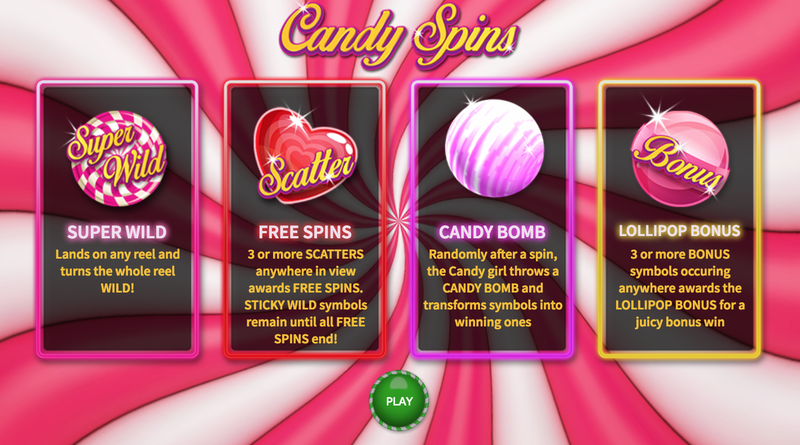 Candy Spins has plenty of sweet features to get your teeth stuck into including candy bombs and a lollipop bonus. Play today at EasySlots.com! 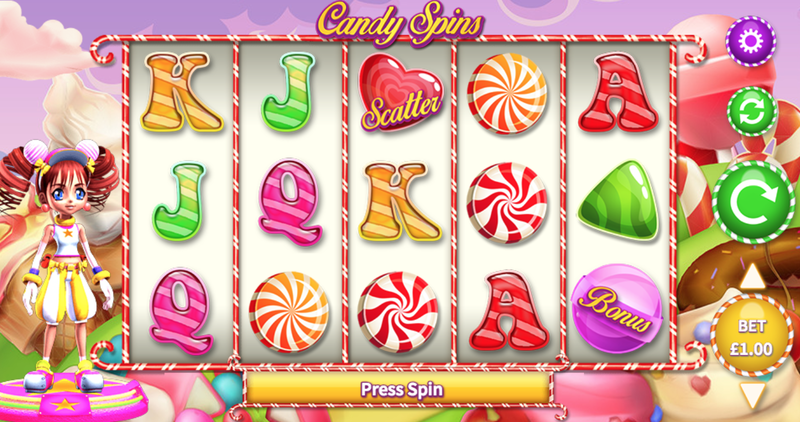 Candy Spins is a 5 reel, 20 payline slot with a delightful candy theme. The magical candy land looks like it's come straight from a dream. A dream filled with candyfloss-filled skies and ice-cream mountains. Behind the reels, you'll see a range of extra large sweet delights including chocolate doughnuts, vanilla ice-cream with sprinkles, and large lollipops. The symbols all fit with the candy theme perfectly and include candy cane playing card suits, candy cane sweets, caramel hearts, and bright pink lollipops. Of course, there's a sickly sweet soundtrack playing in the background. The Super Wild - The super wild symbol in this slot is the bright pink lollipop. Landing a super wild is magical. The lollipops have the ability to transform the reels entirely with wilds. The Scatter Symbol - The caramel heart is the scatter symbol and is also the most rewarding. Landing 3 or more will activate the free spins feature. Landing 3 caramel hearts will award 7 free spins, landing 4 will award 10 free spins, and landing 5 will award 15 free spins. Lollipop Bonus - The lollipop bonus is a fun mini-game. Pick from the selection of delicious lollipops to reveal free spins or a cash prize. Candy Bombs - To increase your chances of winning, Candy will throw candy bombs onto the reels randomly throughout the game. Follow the link to join & spin! Leander Games has been developing unique and entertaining slot online games since 2008. They are one of the most reputable online casino operators in the industry and have won many awards for their fantastic slots. All of their games have exciting concepts with fun features, great 3D animations, and advanced technology. They don't have the biggest range of games compared to other online casino operators, however, the 40 games that they do offer are incredible. They have something for everyone so whether you like traditional fruit machine-themed slots or something more fun and girly, Leander Games has something for you. If you are a fan of Candy Spins, why not take a look at these Leander Games titles? If you're looking for a super cute and girly game then Candy Spins is the slot for you. The delicious candy graphics will make your mouth water and you'll definitely be craving something sweet by the end of the game. The features are also super sweet, particularly the candy bombs feature where Candy helps you create lots of great wins.